No cable anymore! Supports wireless charging. 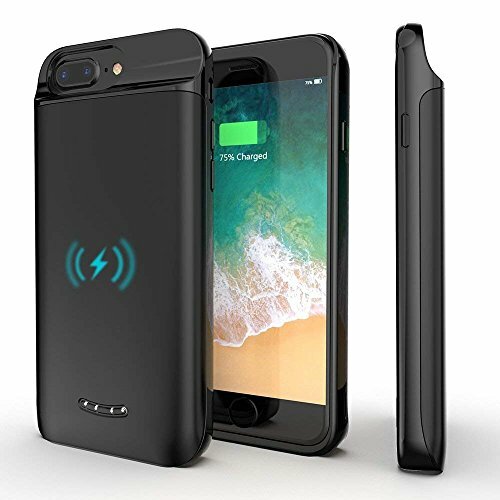 This Qi wireless charging case double your iPhone 8+/7+/6S+/6+ battery power keeps you going throughout the day. Essential for traveling, camping, road trips. Place on any wireless charging pad to charge. It will charge your iPhone first to full then your battery case next. Place on the wireless charger overnight, both your iPhone and battery case should be fully charged. Protective case and frame provide a tough protective shell that surrounds the phone. Plus, the dual-layered frame provides a complete shock-absorbing to protect the phone from drops. The elegant black profile of the case makes it the perfect matching accessory in almost any situation. Industry-leading battery life doubles your iPhone battery power for all day using while on camping, road trips and other occasions. Please gently slide the phone in and out. When remove mobile phone, don't lean it at a huge angle, otherwise the connector will be broken off. 【Important Note】Slide your iPhone 7 plus/8+/6S+/6+ from the top of the battery case to connect to the battery case for charging. To remove your iPhone, ONLY slide up, wrong take off way will damage the lightning connector. 【Wireless Rechargeable】This charging case iPhone 7 is compatible with Qi wireless charge. You can also use any Qi wireless charging pad (not included) to charge both the phone and the battery case together. It also supports lightning cable to charge. 【Lightning Connector】The lightning connector on charging case provide Ear Pods volume adjusting, music and video play control, and answer or end calls. 【INNER SAFEGUARD & PHYSICAL PROTECTION】Certificated by CE, FC and Rosh. The inner smart security chip protects your iPhone 6 Plus/ iPhone 8 Plus/ iPhone 7 plus charging case against short-circuiting, overheating or over-charging. Wrapped with soft TPU material, cushion impact once your iPhone drop accidently. 【100% Satisfaction Guarantee】Purchase with confidence! Lifetime warranty ensures you are protected for the life of this product and a 30 day money back guarantee offers peace of mind, enabling you to return the product in case you don't like your purchase for any reason.